Please select your options below. If you are unsure about a particular option click the icon for an explanation. Some fields require specific information so please make sure you provide all the required information or your order will be delayed. Company Name*: Please type the entity name as you wish it to appear. Please check your company name for content, spelling & punctuation as we will print the name EXACTLY as it is typed above on the spine of the binder, seal and certificates. Authorized Shares/Units*: Enter NA if not applicable. Par Value*: Enter "No Par Value" if you want this printed on your certificates. Enter NA if not applicable. Please carefully review your order*: I understand that my order will be produced using the custom information I provided above. Accordingly, I have fully proofed my order for CONTENT, SPELLING & PUNCTUATION. 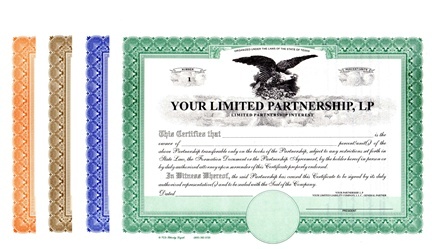 Texas Corporation Supplies - Liberty Legal eagle certificates are expertly lithographed in the USA on our own 24 lb. private watermark security paper. You'll get 20 Certificates with full page stubs printed with your Company information, consecutively numbered, bound and 3 hole punched. We can also completely customize each certificate with shareholder/member information for a nominal fee.